Swinford Clean Street League Awards Night will be held on Friday 28th September at 9pm in the Gateway Hotel Swinford. Swinford Tidy Towns Clean Street League winner to be announced. 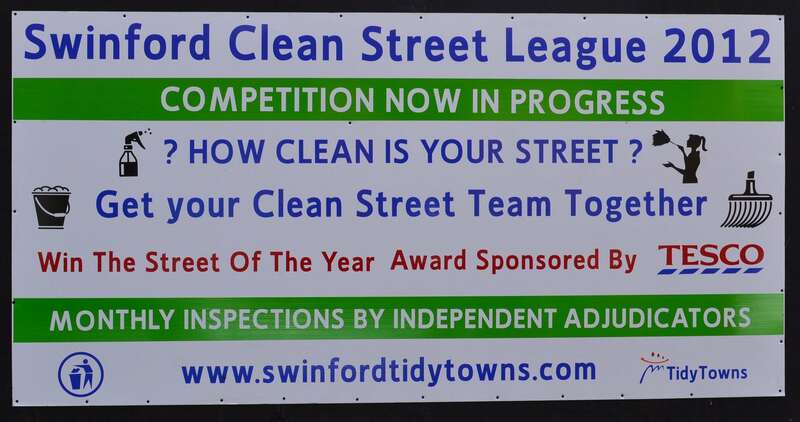 Swinford Clean Street League 2012 September results & winners will be announced at a special community awards function to take place in the Gateway Hotel on Friday 28th of September. The Clean Street league sponsored by Tesco Ireland has been the catalyst for people to get out into their local community and clean their own streets whilst meeting neighbours and making new friends in the community. Judging is ongoing and will continue through August and September with the winners being announced at the awards ceremony. Music will be performed by Out of the Blue which is a contemporary band to suit all. Refreshments will be provided by the Gateway Hotel and admission is €10 with proceeds going to the Swinford Tidy Towns Initiative to continue the work that has been undertaken around Swinford over the last number of months. Apart from the announcement of the Tesco Street League winner, there will be an array of prizes for the best dressed lady on the night judged by an independant adjudicator. This is a community event which gives the ladies in our area a chance to show off their unique style whilst promoting Swinford as a clean environment in which to reside. Please come along and find out if your street is the winner of the Tesco sponsored Clean Street League 2012. Tickets will available in Mellett’s News agency, Cards & Gifts, The Gateway Hotel, and also from any of the committee member’s.